Get in touch with the past when you visit historic New York homes. In a place so full of history it's not hard to find houses where famous figures from the past lived. Travel through time when you visit these New York historic homes. For some of these famous historic homes in New York, it is said that the former residents still walk the halls. 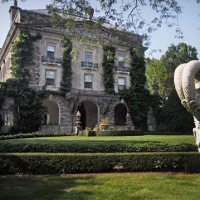 Top of the List of Historic Homes in NY! Built c.1652, the Wyckoff house is the oldest building in New York City and one of the oldest wooden structures in the entire United States. A National Historic Landmark, this house built in the Dutch-colonial style has been a museum since the early 1980s and serves to teach visitors about Dutch-American farming communities in America's early years. The museum can only be seen by guided tours, which are available for individuals and groups. Different types of tours are offered including hands-on tours where you can churn butter, make herb sachets, make your own ketchup and more! 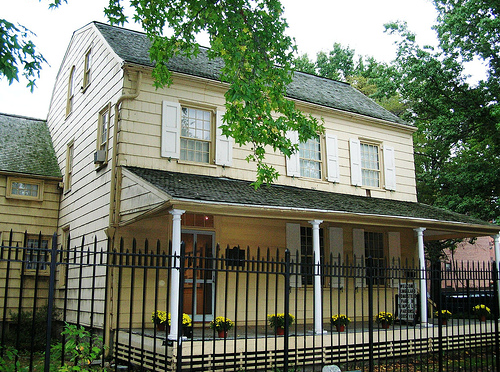 At over 260 years old this house is the oldest building in the Bronx. Built in 1748 as a mansion for the Van Cortlandt family, this historic home in New York has been preserved over the years and gives visitors an excellent look into what life was like in the 1700s. The fourth historic house museum in the country, this NY historic home has been a museum since 1897. 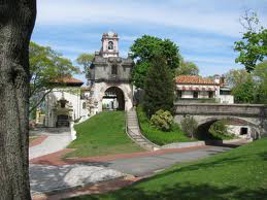 It is listed on the National Register of Historic Places and is a National Historic Landmark. Group tours can be booked or visitors can do self-guided tours. The museum is open Tuesday through Friday. Originally built in the late 1600s, this historic house in New York was home to a Dutch colonial family in the rural farming village of Flatbush. 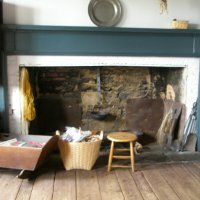 In 1776 in order to prevent the British from using the house and lands, the Lefferts House was burned to the ground by American troops. 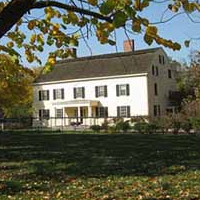 The current Lefferts House was rebuilt in the 1780s and continued to be lived in by Leffert's descendants until 1918. 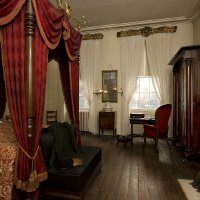 Now a museum which has preserved rooms decorated in period style and special exhibits demonstrating life in the 17 and 1800s this house is a must see for all history lovers. Lefferts Historic House is open Thursday through Sunday from Memorial Day to Labor Day and weekends the rest of the year. School and group programs are offered year round. Historic Landmark with Beautiful Grounds! This historic house is both a New York City Landmark and a National Historic Landmark. Built in the mid 1800s it has been lived in by various families over the years and even played host to New York mayor LaGuardia one summer as his seasonal office. The gorgeous Greek Revival mansion has a large collection of mid 19th century decorations, furniture and fine art. 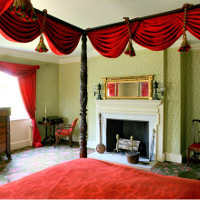 Visitors can join one of the guided tours around the house to learn its rich history. After seeing the inside of the house be sure to take a stroll around the beautiful grounds that surround this NY historic home. The mansion is open Wednesday, Saturday and Sunday. A Palace of the Gilded Age! Constructed in the Spanish Revival style, this house was built in the early 1900s for the affluent Vanderbilt family. The mansion's 24 rooms are filled with historic items and exhibits that show off the collections of William K. Vanderbilt II. When you take a tour you can see the courtyard, living quarters and serving quarters of the mansion. View antique decorations, photos, and furniture as you learn about life in the mid 1930s on Long Island's Gold Coast. Check out the "living history" tours offered on weekends from Memorial Day through Labor Day where you will be taken around the house by guides dressed in 1930s style and meet "members" of the Vanderbilt family. The grounds of the mansion are also home to a marine museum, natural history habitats and much more that will fascinate and delight history lovers. One of the Top Famous Homes to Visit in New York! Home to President Theodore Roosevelt from 1885 until his death in 1919, Sagamore Hill is one of the most interesting historic homes in NY. Visitors can see this famous house and view much of the original furniture, decorations and art that were in the house during Roosevelt's time. Tours are only available with a guide and are on a first come first serve basis. Tickets for guided tours can be purchased at the Visitors' Center. The grounds of Sagamore hill are open daily from sunrise to sunset and visitors can enjoy wandering the eighty-three acres of forest, meadow, salt marsh and beach that make up the surrounding areas. Clear Comfort, a suburban cottage was originally built in the early 1700s and added onto in the 1800s. The lifetime home of Alice Austen, a famous Staten Island photographer from the late 1800s, Clear Comfort is a National Historic Landmark. Tours of the house are available by friendly guides or you can wander through the rooms alone. 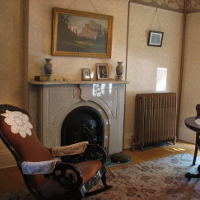 Photographs of each room taken by Alice Austen can be seen so visitors can get an exact look at how the house was during her time. This historic home also has a small shop where you can find books, postcards and souvenirs of your visit. Open Thursday through Sunday, March to December. Built in 1680 by a British Naval officer, this Dutch Colonial style building made a name for itself in history. The Conference House is named for a famous conference that took place in 1776 between Continental Congress representatives and King George III's representative in an effort to negotiation terms of peace and American independence. For $3 admission per adult, guided tours of the house are available. The area surrounding the house also feature many interesting places such as the Russell Pavilion, the Ward House and the Rutan-Beckett House c. 1850. The Conference House is open Friday through Sunday from 1 to 4pm from April to December. 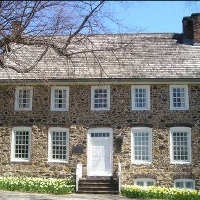 This Colonial style house built in 1785 is the longtime home of the Queens Historical Society. This historic home has been re-located twice throughout history and now sits on a permanent site in Weeping Beech Park. The house has been operating as a museum since the 1970s and has a range of exhibits relating both to the homestead itself and to historic Queens. Learn about the history of the Homestead and the people who owned and lived in it when you explore the upstairs rooms of the house which are decorated in Victorian period style. 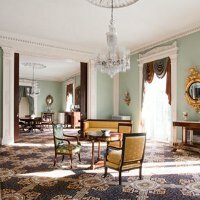 This NY house museum is open Tuesday, Saturday and Sunday year round. Home of a Signer of the Constitution! 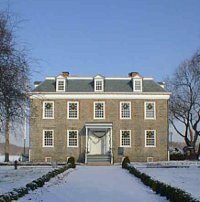 Named for Rufus King, an early American ambassador, politician and anti-slavery activist, King Manor is now a National Historic Landmark. History buffs will delight in looking over the collections and exhibits of hundreds of objects, decorations, furnishings and portraits from the 1800s including over 150 which belonged to the King family. Events take place regularly at this interesting historic house in NY, including "Hands-on History" days where families can participate in crafts, learn history and listen to stores relating to this and other historic houses. This Georgian style home is open for visitors from February through December. Guided tours are offered for free; suggested admission is $5 per adult visitor. Built in 1832 and high on the list of historic homes in NY, Merchant’s House boasts that it is NYC’s only 19th century home to have “survived virtually intact, inside and out.” It is a great example of Federal brick architecture and is located downtown. The house has the preserved belongings (furniture, books, photographs, decorations, clothing, and personal items) of the wealthy Tredwell family and their Irish servants. Built in 1765 by the Morris family as a summer country house, this Georgian house is now a National Historic Landmark. 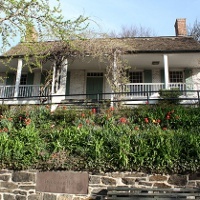 The house has been involved in many historically important events including being integral during the American Revolutionary War where it was headquarters for General George Washington during the Battle of Harlem Heights. The Morris-Jumel Mansion has now been serving as a museum for over 100 years and has a permanent exhibition of rooms furnished in the styles of several time periods. 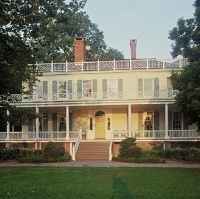 Short term exhibitions highlighting different aspects of history are often on display at this historic home in New York. The museum is open Wednesday through Sunday. This historic house museum in NY dates back to 1799 when it was built by wealthy shipping merchant Archibald Gracie. Over the years this home has played host to visitors such as Alexander Hamilton, Washington Irving and Nelson Mandela. Located within Carl Shurz Park, Gracie Mansion has been designated as the Mayor of New York's official residence since Mayor LaGuardia first took up residence in 1942, though the city's mayors have not always chosen to live there. Tours of the mansion are available on Wednesdays by reservation where visitors can see the richly decorated rooms and antique furnishings of one of Manhattan's oldest surving wooden structures. 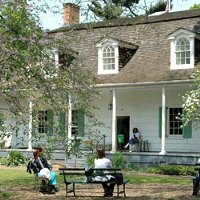 If you would like to visit historic homes in NY then be sure to include the Dyckman House in your plans. The oldest remaining farmhouse on Manhattan Island, this house is a nostalgic reminder of the city's past as a rural farmland. This small house and surrounding garden are a delight to visit. 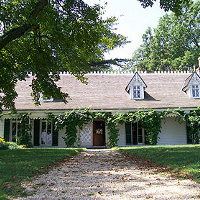 This 1700s farmhouse is open for self guided tours, while guided tours are available for visitors with a reservation. The house is open Friday and Saturday through the winter and Friday to Sunday March through November; admission is $1 per adult. This six-story mansion is an overwhelming place to visit, from the amazing architecture throughout the building, to the extensive art collections to the gorgeous sprawling grounds. Among interesting historic houses in New York, this one is not to be missed. Built by oil tycoon and philanthropist John D. Rockefeller in 1913, it took 6 years to complete this stone house. Many types of tours are available of the house ranging anywhere from 1.5 to 3 hours long. Visitors can see the terraced gardens, coach barn, the underground art galleries of Nelson Rockefeller which include works by Picasso and the lavishly furnished rooms of the house. Truly an amazing place to visit - this mansion is open from Wednesday through Monday, May to November. This 1866 house in Rochester NY is the former home of women's rights activist and suffragette Susan B. Anthony. In 1872 the parlor of this house was the site of the famous moment in history where Susan B. Anthony was arrested for attempting to vote. The current house museum is dedicated to sharing Anthony's lifelong struggle by displaying artifacts from her life and telling her story through the exhibits in the house. The visitors' center and museum shop are located next door where you can buy a unique souvenir or memento of your visit. If you have a group visiting why not try the Tea and Tour, which includes an elegant afternoon tea in the Carriage House after your guided tour. Open Tuesday through Sunday for tours and events.